The shawl *MonBijou* is curved like a banana and rests comfortably on the shoulder. 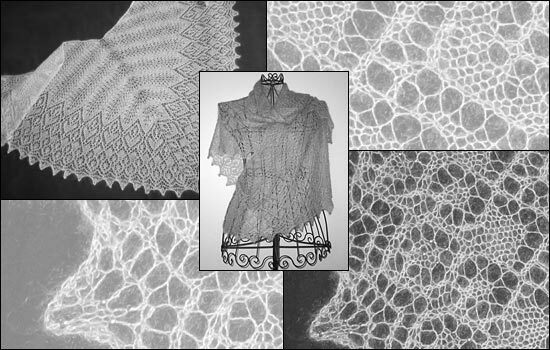 It is worked from the middle of the neckline in a feather-and-fan pattern that merges harmonically into a wide lacy edging. The size of the shawl can be varied by working more or less rows in the main pattern. The edging can be adorned with seed beads. *MonBijou* is made from cobweb yarn – the original shawl weighs only 70 g but keeps warm nevertheless.